Not a lot of people visit Wales. I’m not entirely sure why that is. There are a lot of cruddy places crammed with tourists. Wales isn’t one of them. There are very nice castles, charming pubs, rolling hills, and lots and lots of sheep, and who doesn’t loves sheep? But nobody knows Wales. Wales is famous for leeks, Tom Jones, and what must be his cousin, Catherine Zeta-Jones. And Shirley Bassey. And the guy from The Americans, Matthew Rhys. That might be it. But cut them some slack, it’s a small country. Well, it’s sort of a country. Wales is a country within a country, like Scotland. Together, Scotland, Wales, and England comprise Great Britain (although the United Kingdom also includes Northern Ireland). Scotland and Wales have their own legislatures, and they make many (but by no means all) of their own laws. Is everyone still with me or are you now quietly wetting yourselves with boredom? Anyway, in addition to embodying a distinct national pride, Wales has an impenetrable language with a lot of guttural sounds. To make matters worse, Welsh regularly uses the letters w and y as vowels. The written language looks like somebody dropped a box of scrabble tiles on the ground and then rearranged them completely at random, pretending to spell words. You get many opportunities to read Welsh, because the Welsh legislature passed a law requiring all government signs to be bilingual, even though almost everyone also speaks English. My guess is that the Welsh cultivate this indecipherable language so they can talk about the English in front of them. They’re doing a pretty good job, though. There’s a Welsh BBC channel, Welsh soap operas, and Welsh rugby with Welsh announcers. It’s all very impressive, but I just want to sell all these nice people a vowel. In sum, I really don’t know squat about Wales, although it seems exotic and I do love to learn new things. Also, our good friend Mark offered to host us, so it was an easy call. We were off to Wales. It was a lovely visit. We kicked it off with a dandy dinner in a pub high up on a hill with an epic view of one of the many valleys that slices through the country. 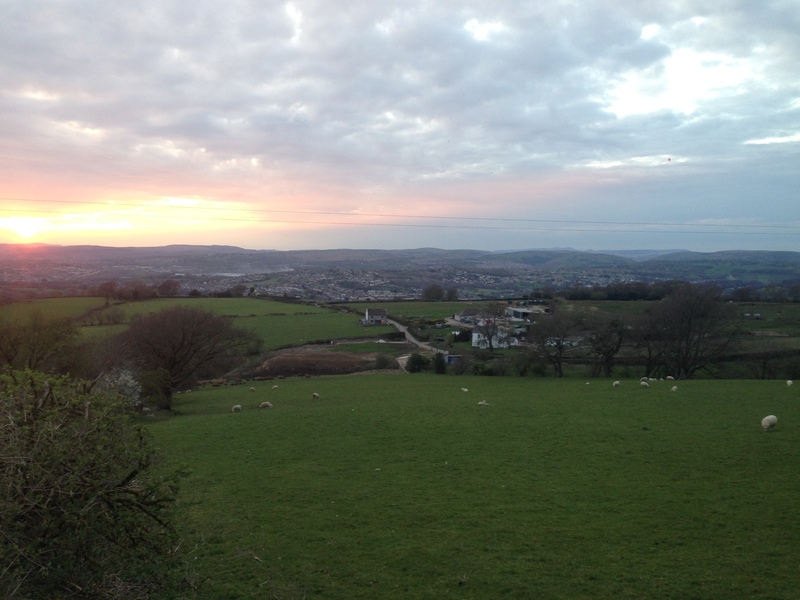 The view from the hilltop pub. We were able to spend lots of quality time with Mark, which included a visit to Caerphilly Castle, the second biggest castle in the UK (after Windsor Castle, since you asked). Caerphilly dates back to the thirteenth century and has two sets of moats, and the only thing better than an old castle is an old castle with two moats. They’ve done a great job restoring the place, so much so that you can now throw a wedding in the Great Hall. You wanna go to a huge castle without all the crowds? Go to Wales. 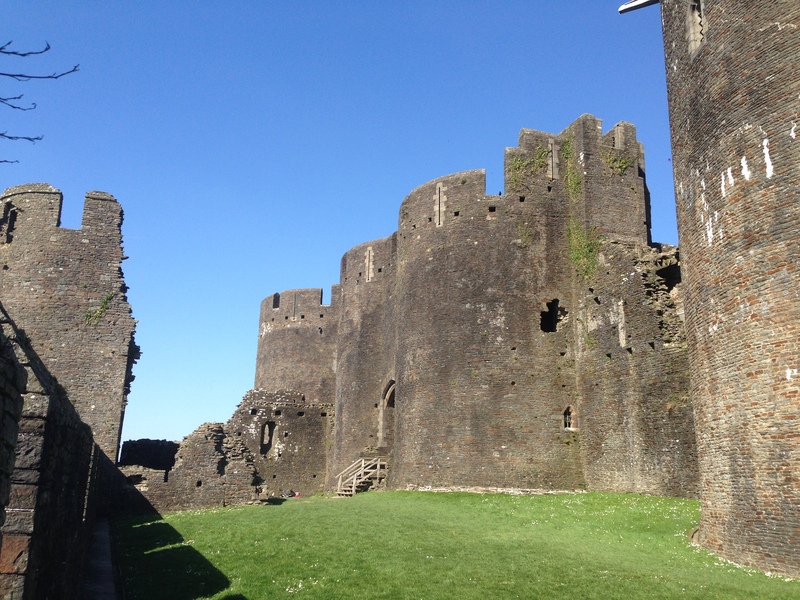 Caerphilly Castle – a most excellent castle. Mark drove us around Cardiff, Wales’s capital city, which has experienced a renaissance in recent years. It’s a charming little city of about 800,000, with some very nice architecture and a dockyard district that has been converted to condos and restaurants. It’s still a bit rough around the edges, dealing like much of the country is with youth unemployment, drug problems, and other social challenges. At the moment, Wales is gripped with a spate of grassland arsons – young people with nothing better to do than set fire to a hillside. But there is also a lot of energy as well as new construction everywhere, including the country’s first parliament building, which was built when a significant amount of power was devolved from the British Parliament in the late 1990s. Our real peek into Welsh life came when we briefly experimented with metaphysics by attending Mark’s village church last Sunday. It was a lovely service, and it gave us a chance to meet a few of Mark’s neighbors. The congregation was on the elderly side – I’d say that our guest appearance that day temporarily reduced the mean age of the twenty or so people in attendance to about 75. They seemed an energetic and friendly group, however. At least half of them came up to us after the service to say hello. While the old church and its only slightly less old attendees were very traditional, the officiant was slightly less so. A very energetic fellow in his early fifties, the preacher seemed downright avant garde in his jeans and untucked knit polo shirt. During his very engaging sermon he referenced the challenges of keeping up with Twitter and email, a concept that might have eluded at least a few in the crowd. But there were old-school hymns as well, as if to provide balance. While I haven’t been inside a church for something other than a wedding or a funeral in as long as I can remember, I still found the whole thing quite nice. We said goodbye to Mark and picked up a rental car for a drive through England up to Scotland, where we’ll meet my mother. Having met us earlier in the trip in Buenos Aires, she has become a jet setter in her golden years. We’re taking a week to meander north, stopping at inns (and maybe the odd castle) along the way. Our first stop is Stratford upon Avon, where the only thing I could get tickets for was that great Shakespearean classic, Death of a Salesman. Ah, but they film Dr Who in Wales. That must count for something? Odd to think you were sweating it out in Bagan just a month ago. I would love to have had a Welsh pony to add to my horse group. It’s never too late to get a Welsh pony. I assume you’re still buying green bananas, however. In your list of famous Welsh persons, you forgot Dylan Thomas. “Do not go gentle in to that good night…” A Child’s Christmas in Wales. Melancholy alcoholic. Untimely death in New York. You missed an excellent opportunity to get toasted and declaim poetically on a hillside somewhere. Maybe in Scotland–you can do a little Robbie Burns after sampling the local fermentation. P.S. The Berlin Post was fascinating. Indeed, Dylan is a notable Welsh dude, although I was keeping it to the living. Janine reminds me that Roald Dahl of Charlie and the Chocolate Factory and Matilda fame is also Welsh, and I think he’s still alive, so I’ll just note that here. Hope all’s well. Huh. Tom Jones is alive. No wonder I was confused. Maybe also Christian Bale and Anthony Hopkins may be considered as being famous living Welsh actors. W = double “u” (as in “how”) and y = Greek “i” (as in Odysseus) in fact are occasionally used as vowels even in more frequntly used tongues. But how to pronounce “ll” as in “Lloyd George”? How about Welsh food? Do the Welsh people cook some special stew out of their sheep or do they just prepare Döner Kebap?